It feels as though Peruvian food is having a moment. Several top chefs have opened high end Peruvian fare restaurants in New York, Washington DC, Miami, San Francisco and more. 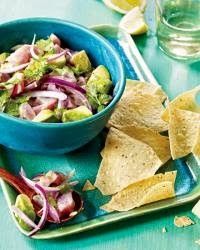 I wanted to share one of my go to favorites, Tuna Ceviche with Avocado. Its a quick, easy delicious appetizer or meal that even kids will enjoy. With the heat of summer fast approaching, a dinner of fresh ceviche is always welcome. 1. Line a baking sheet with plastic wrap. Arrange the tuna slices in a single layer on the baking sheet and freeze until fairly firm, about 15 minutes. 2. Stack the slices of tuna. Using a very sharp chef’s knife, cut the tuna into neat 1/4-inch cubes. Transfer the cubed tuna to a medium glass or ceramic bowl and stir in the red onion, lime juice and black pepper. Cover the tuna with plastic wrap and refrigerate for 1 hour, stirring gently with a plastic spatula every 15 to 20 minutes (the diced tuna will change color slightly). 3. Just before serving, gently fold in the diced avocado and chopped cilantro. Season the ceviche with salt. 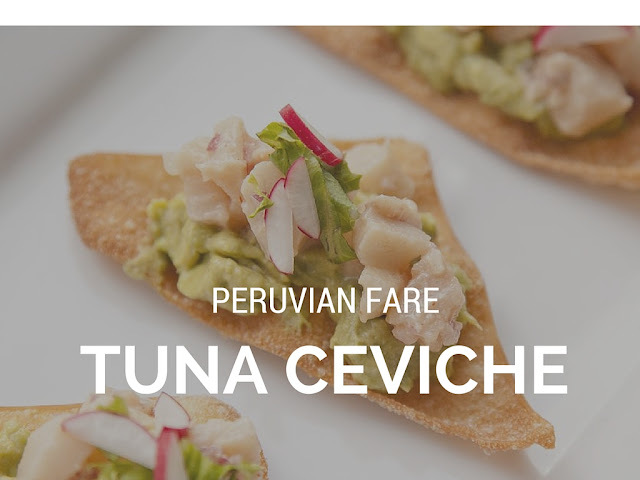 Transfer the ceviche to a serving bowl or individual glasses. Garnish with cilantro leaves. Serves 2. Serve with Tortilla chips.